What is the Building Calling For? A participatory spatial and vocal event at Tate Modern open to all, by artists Sophie Warren and Jonathan Mosley. 1st DECEMBER 2018 13.30 -17.00. Meet at 13:30 at Tate Exchange, Level 5 Blavatnik Building, Tate Modern. To register please contact jpwmosley@gmail.com. Places are limited. Join us for two collective actions inspired by civic resistance. Working with artist and activist Hannah Davey (Liberate Tate & Greenpeace), we will introduce the power and dynamics of group movement through space. The first action, ‘Solidarity Line’ is a playful and cooperative experience that uses everyday movement to explore the architecture of Tate Modern. 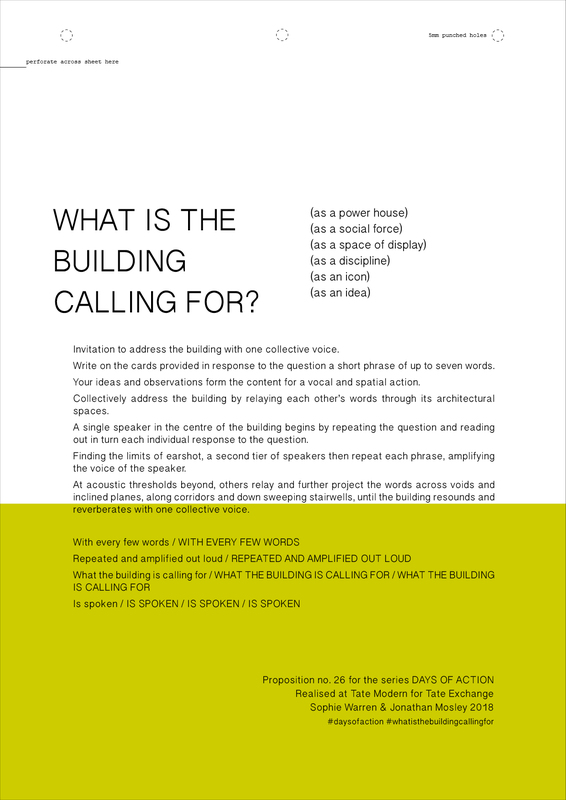 The second action, ‘What is the Building Calling For?’(see below) addresses the building using the People’s Microphone, a technique of amplifying a speaker’s voice by repeating the words with other voices at the limit of earshot. This is followed by an open conversation. The emphasis of the actions is on collective learning and exchange. The physical movement will be simple and accessible, but please ensure you are wearing comfortable clothes. Any personal belongings should be left in the lockers on level 0 of the Blavatnik Building. Light refreshments will be provided. This event will be recorded, and the footage may be displayed in Tate Exchange over the duration of the programme. If you have a response to the question ‘What is the Building Calling For?’ please bring this with you. For further information please see below. We welcome your involvement. Commissioned by Tate Exchange and Spike Associates, Warren and Mosley propose two participatory collective actions for the spaces at Tate Modern from a new series of works titled ‘Days of Action’. The actions respond to the work of lead artist Tania Bruguera and the theme of ‘movement’. Movement is understood as a social, spatial, political act, as is its obstruction and mutation in response to boundaries, physical enclosure and codes of behaviour. Central to this understanding is the exertion of power – power to move and power over the movement of collective bodies, whether this is exerted by a social group in pursuit of a common goal, or by architecture and its associated social codes and rituals that shape the choreography of everyday movement. The collective actions expose and play with these power relations and affective forces, re-positioning the body to the centre of social and architectural discourse. They explore how the corporeal and sensorial experience of being together within architectural space is a form of knowledge in itself and allows for reflection on both existing and emerging spatial and social orders. Facilitated by the artists with artist/activist Hannah Davey (Liberate Tate / Greenpeace), ‘Solidarity Line’ and ‘What is the Building Calling For?’ use collective devices from civic resistance and direct democratic assembly to explore particular relations of ’them’ and ‘us’, ‘I’ and ‘we’. Architecture is exchanged for the ‘other’ (the counter protest or authority), to be negotiated not as an antagonist but as an affective force that can generate new social possibilities and spatial orders. ‘Solidarity Line’ uses the bodily formation of the defence line, that instead of defending territory, becomes a transient line – a moving border, a living architectural element. The participants, without speaking, draw on an attentiveness to each other and the environment, navigating through the circulatory spaces of Tate Modern by collective intelligence. Individuality is constantly re-negotiated according to the needs and demands of the group and in response to built form. ‘What is the Building Calling For?’ is a vocal and spatial action. The question becomes the content for a collective address to the building relayed through its foyers, landings and stairwells by participants using the ‘people’s microphone’ (human amplification of a speaker’s voice through repetition of words by other voices at the limit of earshot). The collective voice of the participants aim to inhabit the acoustic territories and thresholds of the architecture, witnessed in turn by visitors. Over the course of three afternoons ‘Days of Action’ opens up a space for experimentation, exchange and mutual learning. The events invite participation from three distinct groups. The first Tate’s Visitors through an Open Call. The second group involves Tate Neighbours and those who work at Tate Modern across the different teams including cleaning and security staff, invigilators, administrators and curators. The third group includes those studying architecture, politics and museum practice, all of whom share an interest in the politics and design, scripting and curating of contemporary art space. The actions propose new orders of movement that aim to foster new relationships between the building and those who use it and an interconnectedness between building members and their individual spheres of operation. The final day of ‘Days of Action’ is followed by a discussion led by Dr Bernadette Buckley, Convenor of MA Art and Politics at Goldsmiths. Everyone is welcome to join in.